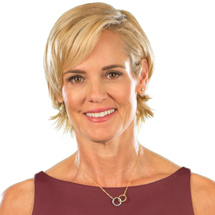 Dara Torres is arguably the fastest female swimmer in America. She entered her first interantional swimming competition at age 14 and competed in her first Olympic Games a few years later int 1984. At the 2008 Beijing Olympics, Dara became the oldest swimmer to compete in the Olympic Games. She took three silver medals home, including the heartbreaking 50-meter freestyle race where she missed the Gold by 1/100th of a second. America loved her for her astonishing achievements and composure in the face of defeat. Dara has competed in five Olympic Games and has won 12 Olympic medals. Her impressive performance in Beijing and her attempt at the 2012 London Olympic Games has inspired many older athletes to consider re-entering competition. Aside from her amazing accomplishments in the pool, Dara has talents on dry land as well. She has appeared on such shows as Fox News, ESPN, CNN, Today Show, Kelly and Regis, and Good Morning America. Dara was the first female athlete ever to be featured in the Sports Illustrated Swimsuit Issue, won the 2009 ESPY award for "Best Comeback", and named one of the "Top Female Athletes of the Decade" by Sports Illustrated. Her memoir, "Age is Just a Number: Achieve Your Dreams at Any Stage in Your Life," published in April 2009 was listed as one of the top 25 best-selling business books by June. Her second book, "Gold Medal Fitness: A Revolutionary 5-Week Program" is now a New York Times Best-Seller.